Century Motorsport are showing no signs that 2016 is their debut in the grueling Dubai 24 Hours so far. Topping the time sheets in two of the four pre-event practice sessions put the team in good shape for this afternoon’s qualifying. Leading the way for the team was University of Bolton, Mugari Automotive & Vålerbanen supported #229 team of Anna Walewska, Nathan Freke, Tom Oliphant and Aleksander Schjerpen. 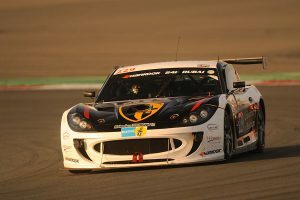 Despite Oliphant being the only member of the crew with previous competitive experience at Dubai, the quartet of drivers quickly started to work well together with their efforts being reflected on the timesheets. 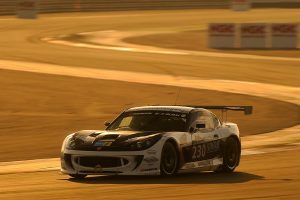 The #230 Alcon Brakes, AVS – Adaptive Vehicle Solutions, Wild Water, Euro Marketing and Gravity Road supported Ginetta G55 of Ollie Jackson, Jake Rattenbury, Ruben Anakhasyan and David Pattison was also putting on an impressive display, as Ollie lead the way in terms of experience within the team. Qualifying was very close, with pole position becoming a shootout in the end between Nathan Freke and main rivals Optimum Motorsport. In the end, Freke’s best was good enough to place the #229 Ginetta second in class SP3. Ollie Jackson recorded the fastest time of the session for the #230 car as the crew continue to improve their partnership starting the race from seventh.